In seeking a pair of suitable trousers to work with many items in my wardrobe (and specifically with my 2015 SWAP) I have narrowed down the options. For now I have discounted 1. As I am allowed to have a RTW item in my SWAP I can always use a pair of jeans from my wardrobe. One thing about the two jackets and the coat I am making is that they all have a bluish look so I could go for denim. While I am keen to make jeans one day, this is not a pressing issue. I am going to keep the Simplicity 6087 as a last resort. I know these trousers suit me and I can run them up in an evening or two at any point. They don’t need testing. So now I come to item 3 – a pair of well fitting tailored pants. I know this is not my best look, but I am tempted to give it a try. And now is the time. I could make a wearable toile and then consider whether or not to build the tailored trousers into my SWAP. If it is not a good outcome I will move on to one or more of the other options. So, while tailored trousers are not the best look for a shaped bodyline, I am going to give them a try. I have very few vintage trouser patterns and most are voluminous. I think I need a contemporary look for these trousers. I have a piece of grey linen that blends with the charcoal wool, but I am longing for a bit of drama. I am also thinking it would be nice to have a bit of lycra in the mix for wearability, or maybe this is where I can use a third colour. At the back of my mind I am thinking tailored Capri trousers in a luxury evening fabric, a colourful stretch wool, or even my squiggle fabric. Here is a lovely photograph of a tapered, cuffed ankle length trousers in a gorgeous colour. Although sold as “Capri” pants you can see that on a petite model the length (ankle grazing) is appropriate and flattering. I like this length on me whereas Capri just shorten the legs. Thanks Phi-Phi for letting me us your photos. I love your styling too! To get something similar I looked at what Burda has on offer, and chose something suitable. Now the photograph associated with the pattern I have just down loaded is pretty shocking. The model has muscular thighs and as adopted a ridiculous air-guitar pose, so it is hard to tell what the trousers look like. Here is the technical drawing, which has more appeal. These trousers have a number of attractive features. They fit at the high hip rather than on the waist, like the J Crew pants. They have side pockets and a fly front as required. I also find the turn ups an attractive feature, even though shorter women should not normally wear horizontal lines. I downloaded, taped and altered the pattern so that the waist line was one size smaller than the hips. 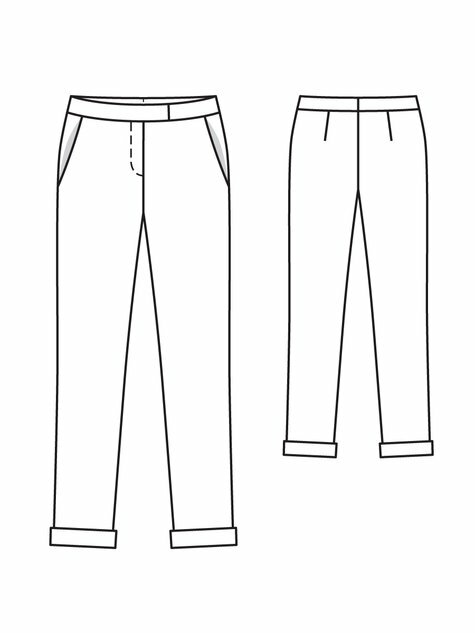 This is an easy change to make when you use a multi-size pattern to make your own trousers. Just taper the lines from one size to the other. I like the fact that they have a seamed waistband that allows fitting in the back. This ensures that you can fine tune the pattern without messing around with either the pockets or the fly front. 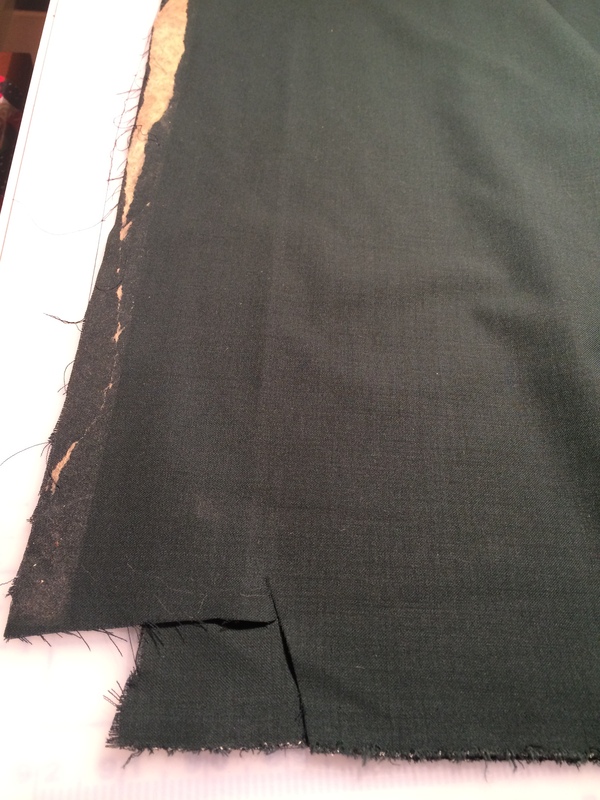 I had a piece of dark green wool in my cupboard that was low cost as it was an end of roll. You can see the tell-tale sticky tape. This is how fabric is often rolled. The edge is stuck down on the roll with paper masking tape or other sticky tape. Then the machine rolls the fabric automatically. I often get fabric like this at low cost. I try to pull off the tape, but even then there is invariably a sticky residue. So when I can I avoid including this bit of the fabric, or just use it in the seams. You can see there is also a sample cut out. No problem. It is just a matter of arranging the pattern pieces carefully. The reason I chose this unlabelled remnant was this little tell tale whiteness in selvedge. Of course you know it has elastane (Lycra) in it because it has some stretch. Stretch can come from a fabric being knitted (a jersey) or if it is woven, through the inclusion of an elastic fibre in the yarn. For trousers that you want to bend down in elastane is a great shape. So while it can add to the cost of wool if I find a good quality wool remnant with Lycra in it I will buy it. So this was a good chance to use one of my remnants. 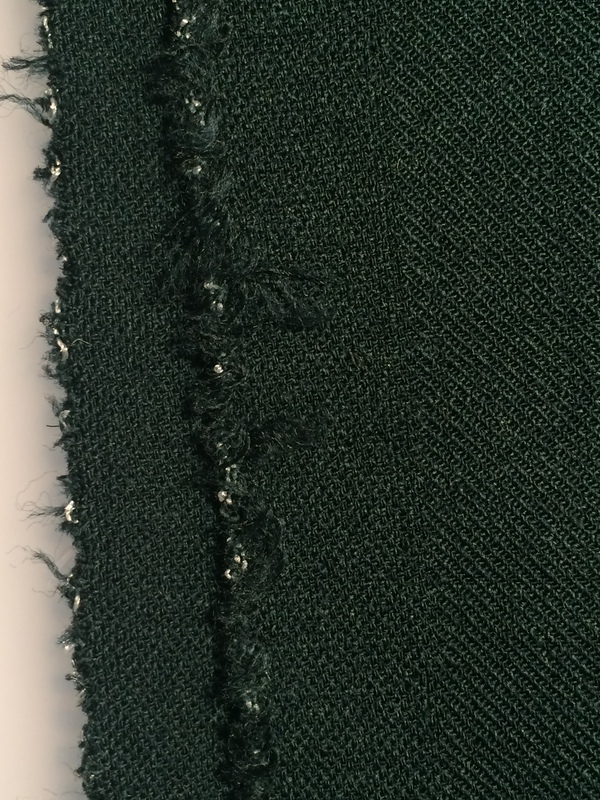 No seam allowances is not a problem. Personally, once the pattern is assembled, I cut out my size (in this case the hips and waist are different sizes). I pin it to the fabric leaving enough space between the pieces. I use chalk to indicate the notches and cut these as triangles. 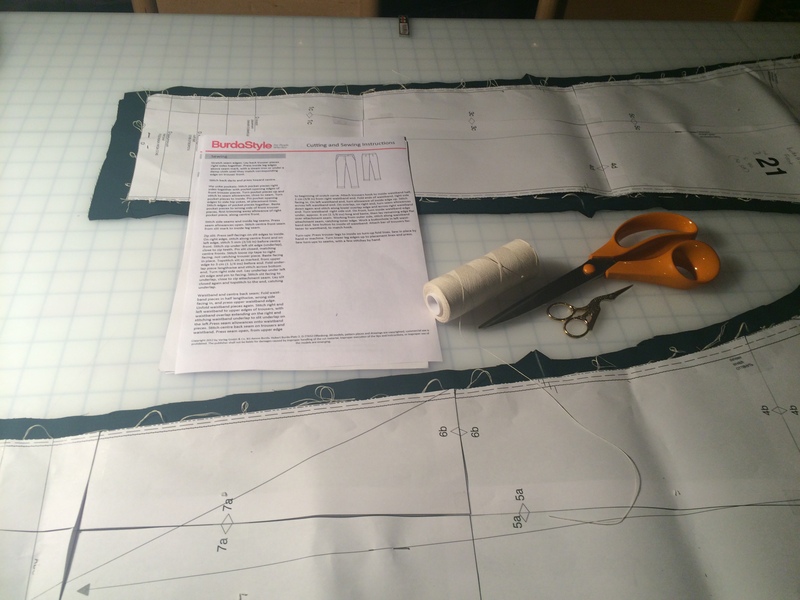 I cut approximately 5/8th inch seam allowances, with extra allowed where I may need to let out the pattern. I allowed a little extra at the hem in case the trousers were too short. I then trace tack the sewing line. This is very useful when creating a toile as it allows great accuracy. When making tailored items I find these tread tacks absolutely invaluable. The photograph above shows how scant the instructions are. If you know what you are doing they are just fine as they do describe an order of work that is reliable. When it comes to describing something tricky – a lapped fly front (described here as “zip slit”) can be very challenging – they are almost impossible to follow. I had not made a fly front for a while so I looked on the internet for help. There is a great video from Threads magazine which I heartily recommend. I will write up these trousers when they are finished. Like these a lot, Kate. It’s a pattern I’ve thought of making myself at some point. I’m looking forward to seeing the result. Looking forward to seeing these finished. Burda has some great trouser patterns! Oh.. I am on trousers quest for years now… I love the shape of these pants! I have to start working on them again. I am looking forward to see your dark green wool pants!